Like Kafka, Wittgenstein, Emily Dickinson, Bodhidharma or Heinrich von Kleist, Socrates was an overman. The overman is someone who is affected by the totality of human/existential problems – the extreme quasi-nervous affectedness and being agitated by the totality of human/existential problems is quasi the essence of the overman – and handles them at the highest level of analysis and integration (commonly referred to as the meta level). Being the conscious reflection of the totality of sets of human/existential affairs, he is the hyperset. Think of some kind of smoke emerging from the flat surface of the populated earth, in apparent serenity, and diffusing into the air, as a cloud of smoke, then gradually diffusing into ever more transparency, and you have the overman (for instance, as a mental image that may come to mind). No one will be more located and more dislocated on earth than the overman! No one will find human/existential affairs more silly and absurd and not be affected by them, and no one will clinge to them with greater sincerity and gravity and be more affected by them. No one (unfortunately) will escape the grasp/embrace of institutions and institutional logic more, but also recognise the depth and profoundness of institutions and of the law like no one else does than the overman (with Melville for instance being the only honest and uncorrupted person in his office in which he had to work after his career as a writer came to an end due to human ineptitude). At some point there will also be some coolness towards the science, philosophical, escatological stuff, as at the overman level there is not so much anymore at stake and as he has become medium and instrument of sticking to escatological etc stuff, and that is enough – science and philosophy and the growth of knowledge will go on, fractal-like, the individual overman cannot foresee what will be 3000 years in the future, at any rate he will not be surprised by it and that is what matters. He lives both in the Weltzeit and in the Heilszeit – respectively in what I called a while ago the Continuum (of the spiritual essences of the great ideas of man). As he clinges to truth, he becomes depersonalised and objectified. As he finds out, establishes and holds truth, he becomes transpersonalised and extremely idiosyncratic in his subjectivity. The nebulousness of ego allows a much higher level of psychological integration. Due to his fluidity, the overman might clash with the man´s (intractable) world. Socrates was put on trial at the age of seventy for „corrupting the young“ and „not believing in the gods in whom the city believes, but in other daimonia that are novel“. To understand this, specifically, one has to know that – as one of the odds that usually characterise societies and that may become contradictory in critical situations – Athens at that time was a very rational and progressive, democratic society – but also very traditional when it came to clinging to its own religion and mythology; in that respect Athens was backward to more peripheral regions of Greece or Asia Minor (which probably triggered feelings of inferiority within a superiority complex) and Socrates was not the first person to be put on trial for religious reasons, there had been examples before. Five years before Socrates´ trial, Athens had suffered defeat in the Peloponnesian War which triggered insecurity among the population, conservatism and hostility towards experiments and a challenging, adventurous spirit like that personified by Socrates. The main prosecutor, Anytos, obviously was free from mean-spirited motives, but actually believed Socrates to be a danger to religion and social cohesion. More generally, Socrates explains in his apology how his quest for truth, sincerity and human betterment had to a significant degree always been met with hostility and envy by those whose feebleness he exposed and, as such, cannot be turned into anything better („to his grief and to his heartache“ he found out that he made himself unpopular by the learned and educated as he exposed their lack of substance, and, furthermore, that the common people – whom the intellectual outsider may come to regard as more pure and authentic than the pretentious intellectuals – in reality are not any better – and neither are the artists). Socrates´ tragedy was that in his quest for grace of man he put disgrace over many people. 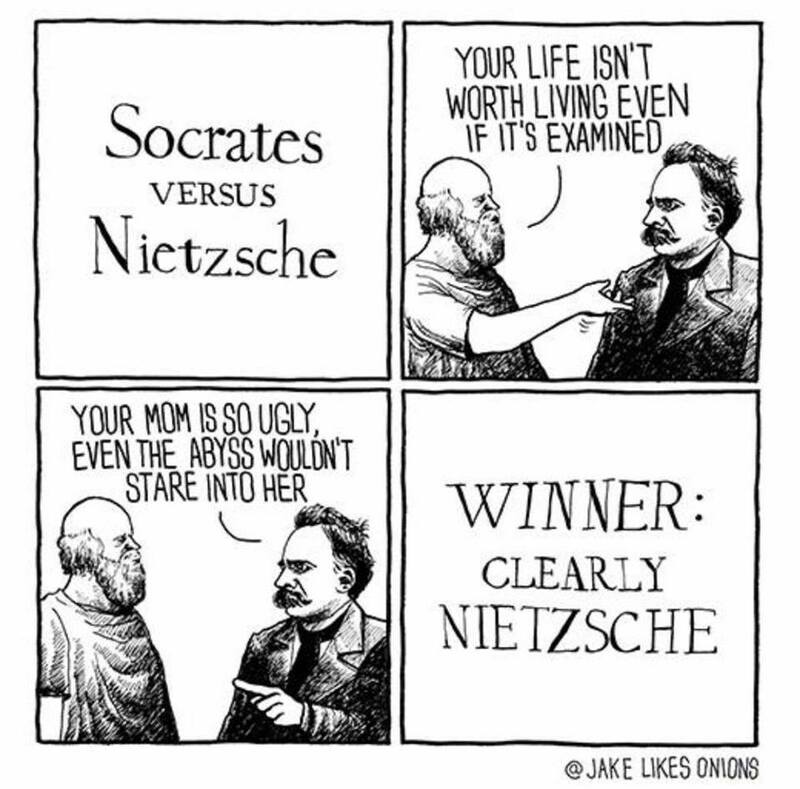 Someone like Socrates stands in a certain opposition to society, that may become lethal. – After Socrates was sentenced to death his friend Crito tried to persuade him to flee. Socrates, however, refused. The main argument was that in doing so he would cease to be a law-abiding citizen, and even if the law may be(come) problematic or conflictual, the law is older than the individual, an order ancestral and higher to the individual that should not be refuted for egoic motives (other aspects were that Socrates would lose his dignity if, as a 70 year old philosopher, he was so obsessed with living a couple of years more, in a foreign polis, where he likely would not be taken serious and also had spilled his reputation among the people of Athens further; as at the trial he did not try to defend himself by appeasing the others but only by holding on to the truth he would now have to bear the consequences) – on the whole, Socrates` legacy as a philosopher and wise man and as an icon would not have been as powerful and uncorrupted if he had followed Crito´s advise, indeed. Socrates died as he lived, hence his spirt became immortal. Philosophy does not mean that someone possesses all wisdom, it means love for wisdom, and with his unpersonal clinging to truth itself, Socrates is the archetype of philosopher. Finding out and holding on to truth and knowledge and being virtuous can be seen as ends in themselves and to make up for a happy (probably socially excluded, but also self-contained) life. It is an eudaemonia. Philosophy, as a quest for virtue and truth, finally is a matter of the individual, and can finally only be reached by exceptional individuals, for a personal, subjective goal as well as for a general, objective one. Philosophy is transindividual, transsocial, and transpolitical. Philosophy can make guidance for the human/political realm but, to a certain degree, is likely to be at odds with the demands of the political sphere – pure philosophy cannot be executed in matters of politics and neither can philosophy purely be attributed to the human/political/social realm without losing its edge and sincerity (as Socrates said in his apology, he could have not remained a virtuous man if he had become a politician). These are, to some degree, heterogenous realms. In the human realm, and in political entities, you have a certain primacy of people holding to faith and to opinions, to ideologies and to emotions (not only necessarily among the populace but also among those who govern), and the philosopher, with his quest for unideological truth, is a kind of intruder who may not be properly understood and, moreover, met with jealousy, envy and hostility, as he does not flatter people´s egos. The fluidity of the philosopher meets an intractable world – and probably not without reason, since it may be the philosopher who, with his colourful mind, is detached from (a drab) reality. Politics is about regulating and managing the affairs of people that live together in a community. It means balancing the interests of individuals and groups to which they belong. The interest of people and groups usually revolves around enabling a good life for themselves, accomodating the world to their respective worldview and maximising their profit (Will to Power, as Nietzsche remarks). In doing so, individuals and groups may be at odds with each other, how they are balanced then is a matter of their respective power (where the power attributed to them can a personal one, or attributed to them due to anonymous, unpersonal matters of fact, for instance changes in technology that produce „winners“ and „losers“). A good political system is where a maximum number of people benefit, where there are just rewards and power/interest balancing is uncorrupted and impersonal. A good political system seeks to reproduce itself at a higher level of quality (and also taking the interests of foreign communities in account). Such a community will believe in itself and act in a disciplined way and the common good will be achieved. A political system is, at first, about accomodating people´s material interests – but also emotional and ideogical aspects are important and somehow „transpolitical“ or metapolitical. They are about how a community understands itself and how social cohesion can be established. A community is based on a feeling of togetherness (Wir-Gefühl), and where such a feeling of togetherness erodes it is likely to become a political problem and to undermine trust in the political system or the whole trust a society is based on (note that such an erosion of Wir-Gefühl need not be a direct problem for the individual or a social problem, as for instance the Islam of immigrants need not affect anyone in Europe but themselves, but will be articulated as a political problem of identity politics). The ancestral is a primary source of identity. Nationalism, religion, ideas like „liberté, egalité, fraternité“, communism, being a member of Nato or a neutral state, etc. are such ideological/mental brackets, whose sources need not necessarily be a simple emotion, but heavily involve emotions, amalgamate emotions, interest and rationalisation and reduce complexity. They are a substitute for the philosopher´s usual awareness of feeling integrated into a greater whole of a (transcendent) order, and they are not necessarily an extension of a person´s ego, but of the persons´s heart and mind. Therefore, such mentalities are important to people and important when it comes to political discourse (and, as rulers know (? ), in the name of „religion“, „the nation“ and the like it is relatively easy to make people bring sacrifices or even sacrifice their own lives, whereas altruism or reason per se are not). Political discourse is relevant as, in a maybe-contrast to the wise man who prefers inner mono/dialogue, people like to talk, usually all day long. It is vital for them to talk and chat and make themselves feel know-all. Eventually, such attachments to mentalities/ideologies/cultures, designed to embed the individual in a greater, meaningful whole, are, to some degree, also an alienation of the individual or a diversion from his own emptiness, as the understanding of people of the ideologies they clinge to or may even defend with tooth and nail usually is feeble and shallow and phraseological: Socrates, who clinged to nothing but the truth, even at the cost of his own life, exposed that – incipit tragoedia. The philosopher, however, has the power to give new meaning to the human realm or the specific requirements of his age and plays therefore a vital role in the history of mankind, be it an asynchronous one. This entry was posted in Blog, Philosophy, Politics, Super Sanity/White Lodge/Übermensch by admin. Bookmark the permalink.